On 17 November 2017, an inauguration ceremony at the Struma village school in Roskovec occurred. The renovation of the ‘7 Dëshmorët’ school is an investment of €567 000 and part of the Trans Adriatic Pipeline’s (TAP AG) Social and Environmental Investments in Albania. The works comprise the complete renovation of the building, equipment of the classrooms with the necessary academic materials, and the improvement of the school grounds. The following attended the inauguration ceremony: Albanian Prime Minister Edi Rama; Minister of Infrastructure and Energy Damian Gjiknuri; Deputy Minister of Education, Sport and Youth Shpati Kolgega; Mayor of Roskoveci, Majlinda Bufi; TAP President Walter Peeraer; TAP Managing Director Luca Schieppati; TAP Commercial and External Affairs Director Ulrike Andres; and teachers and pupils. 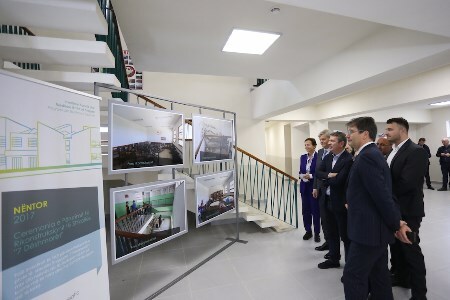 During the tour at the school premises, the officials were informed by the school’s principal about the severe conditions of the school prior TAP AG’s investment. They visited the facilities and the grounds and saw in person the improved conditions that this schools offers now for the pupils. Gjiknuri expressed his appreciation on the environmental and social investments TAP AG has made in the country: "I would like to express my thanks to TAP AG for the collaboration, joint investments and projects in other areas, such as the development of gasification system across the country." Meanwhile, Rama emphasised that "this school and many other infrastructural works along the Trans Adriatic pipeline (TAP) route come as a result of the collaboration of the Government with TAP AG. It is a pleasure for us to testify the results of these changes, yet we would like to do more than that." The approximately 290 students of the 7 Dëshmorët school will benefit from better conditions and higher safety standards. TAP AG and its shareholders are pleased to have provided an investment that has meant the complete renovation of the school facilities and grounds. A total of approximately 2000 m2 of interior space was reconstructed and the classrooms were furnished accordingly. Now, the students also have a school yard of 2900 m2, which is transformed into a large recreational park with green areas and sports grounds. Aiming at establishing new safety standards, TAP AG equipped the Struma school with a fire alarm system and emergency exit stairs. The 7 Dëshmorët school is the second school that TAP AG has completely renovated during 2017, within the framework of its social and environmental investments. ‘Thanas Ikonomi’ school in the Grecalli was inaugurated in October 2017 while the works at the ‘Fuad Babani’ school in Bilisht are nearing conclusion. In 2015, TAP AG reconstructed the sports facilities of the ‘Andon Profka’ school in the Seman village.